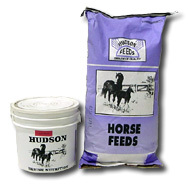 A complete feed for mature horses. INGREDIENTS: Roughage Products. Forage Products. Grain Products. Processed Grain Byproducts. Plant Protein Products. Cane Molasses. Vegetable Fat. Calcium Carbonate. Sodium 3entomte. Salt. Monosodium Phosphate. Vitamin E Supplement. Sodium Selenite. Calcium Propionate. Vitamin A Supplement. Choline Chloride. Copper Sulfate. Zinc Oxide. Active Dried Yeast. Manganous Oxide. Niacin Supplement. Ferrous Sulfate. Vitamin D3 Supplement. Mineral Oil. d-Biotin. Menadione Dimethylpyrimidinol Bisulfite. Vitamin E12 Supplement. Riboflavin Supplement. d-Calcium Panto±enate. Thiamine Dihydriodide. L-Lysine. Natural and Artificial Flavors. Folic Acid. DL-Methionme. Pyrtdoxine Hydrochloride and Cobalt Carbonate. Horse Weight 800 lbs. 1000 lbs. 1200 lbs. Maintenance 10-12 lbs. 12-14 lbs. 14-15 lbs. Light Work 12-13 lbs. 13-16 lbs. 16-17 lbs. When fed with hay, reduce feeding rate by 1 lb for each 2.5 lbs of hay fed. The feeding ranges are suggested guidelines only. The aged horse tends to consume less feed than younger animals of the same mature body weight. Also, research indicates that the aged animal is less efficient in digesting feed. Final feeding rates must be adjusted on an individual basis of Hudson 14% Senior and the extent of their influence cannot be predicted. Make diet changes slowly. Clean and fresh water should always be available. Hudson 14% Senior contains high quality fiber and can be fed as the total diet. A regular feeding schedule should be maintained. Feed a minimum of two equal spaced feedings daily. When possible, it is recommended that the feed be offered m 3 equal feedings. WARNING: This feed contains copper. Do not feed to sheep or other copper sensitive species.